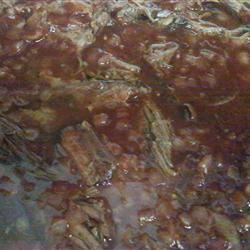 After growing up in West Texas for 30 years where barbecue is the best, I found this recipe which is so tender and absolutely delicious. 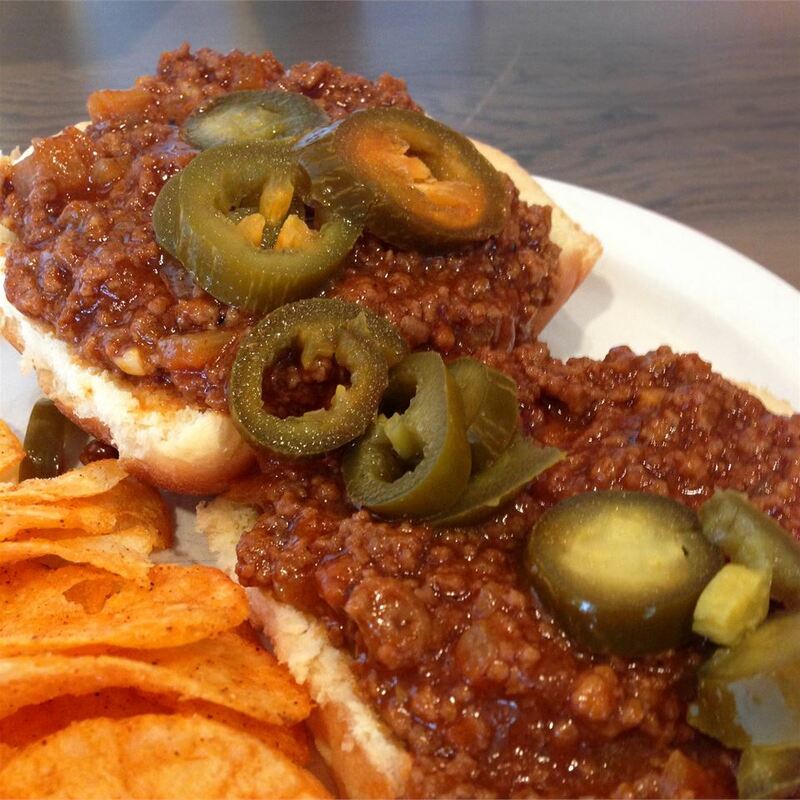 Leftovers, if you have any, make really great sandwiches. 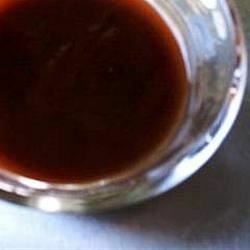 You can increase the liquid smoke to 4 tablespoons for really smoky flavor. EVERYONE SHOULD MAKE THIS RECIPE Every single one of my 35 guests raved about this fantastic dinner. It melted in your mouth. 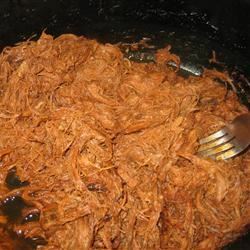 I marinated for 10 hrs in the fridge then cooked on LOW in a crock pot/slow cooker for alsmot 12 hours. Then added the bbq sauce mixture (made a double batch so it was sloppy & juicy-hubby likes it that way! )& put it back in the slow cooker for another 1 or 2 hours. Served on soft rolls. I will make this again & again. 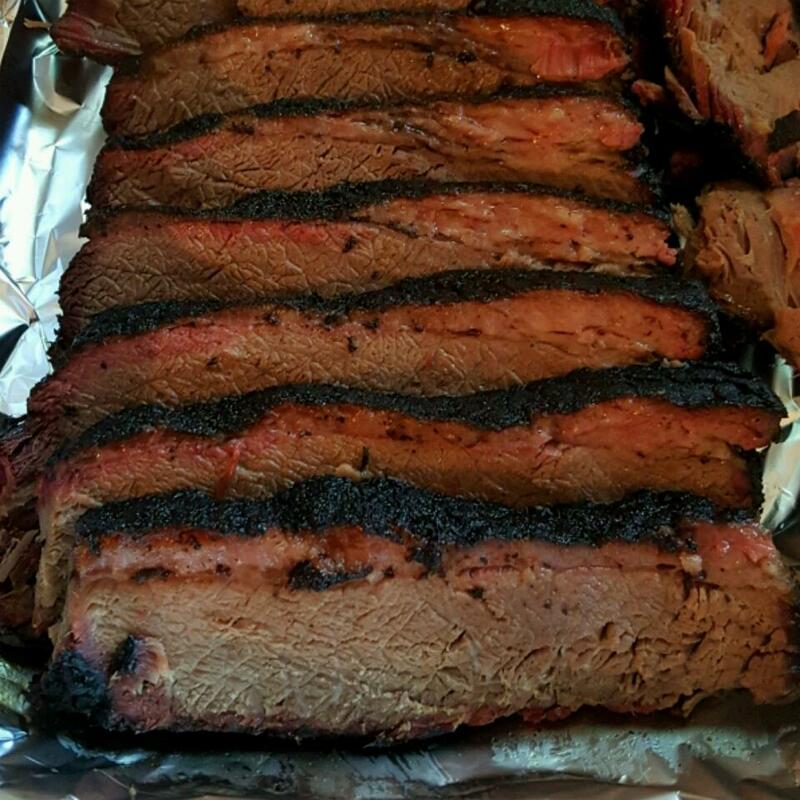 (to serve 35 people I made 3 9 pd briskets) along with a bunch of other sides. THANK YOU!!! I did not care for this at all it had a vinegar taste (even though there is none in it) Maybe I did something wrong I doubled the recipe and kept tasting it and ended up throwing it away. Living in Kansas City we have numerous kinds of BBQ sauce here it is interesting how many differnet types of sauces there are depending on the region you live in. 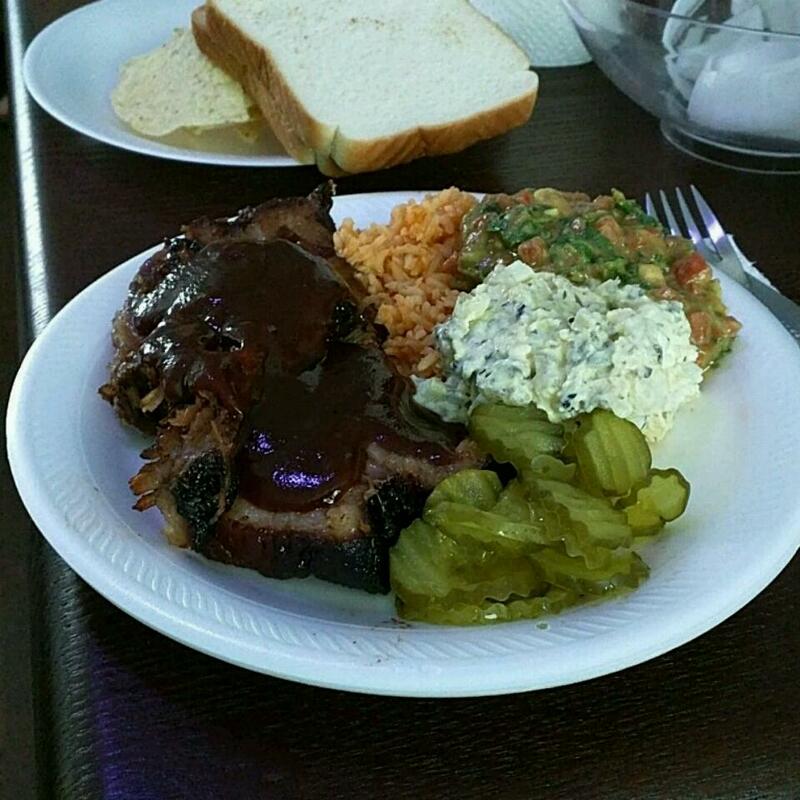 It depends on everyones different tastes I guess Texas BBQ sauce is not for me. But according to the reviews lots of people did like it thanks for the post anyway! 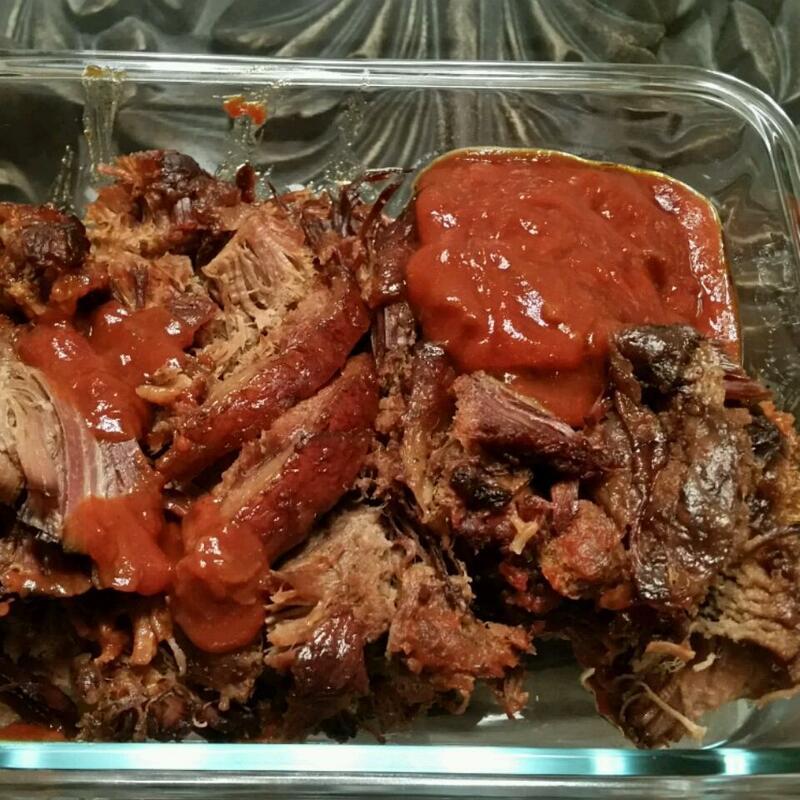 Believe it or not I thought this tasted better WITHOUT the last step of adding the BBQ sauce/cooking for the extra hour--here&apos;s why; After being cooked at 275 degrees for 1 hr per lb. 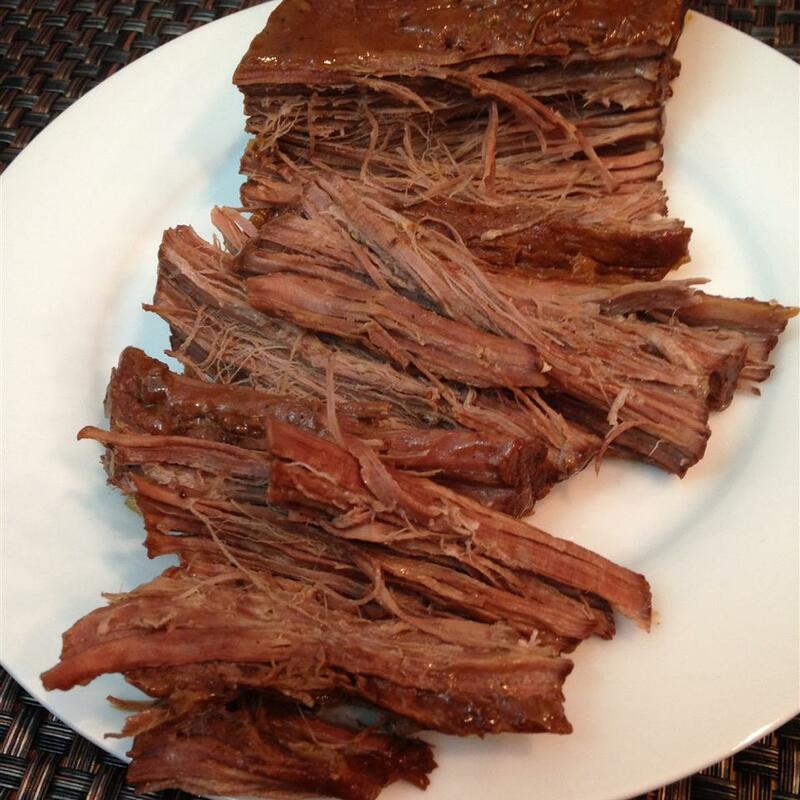 the meat sliced beautifully and tasted moist and flavorful. 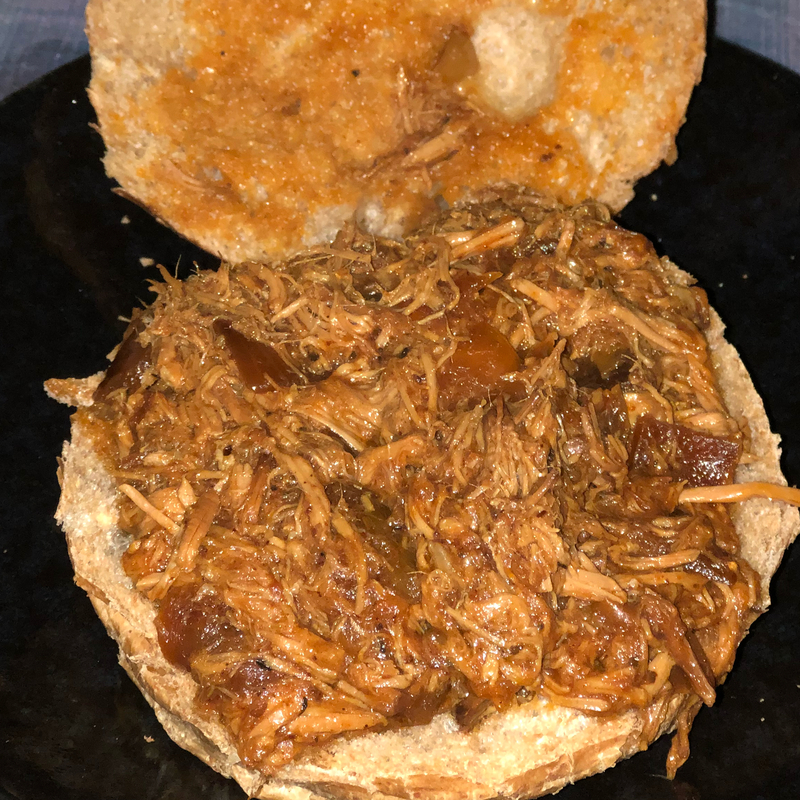 After adding the BBQ sauce and cooking for another hour the meat was more like pulled pork which tasted ordinary--even my picky 5 year old daughter preferred it w/o the sauce!. 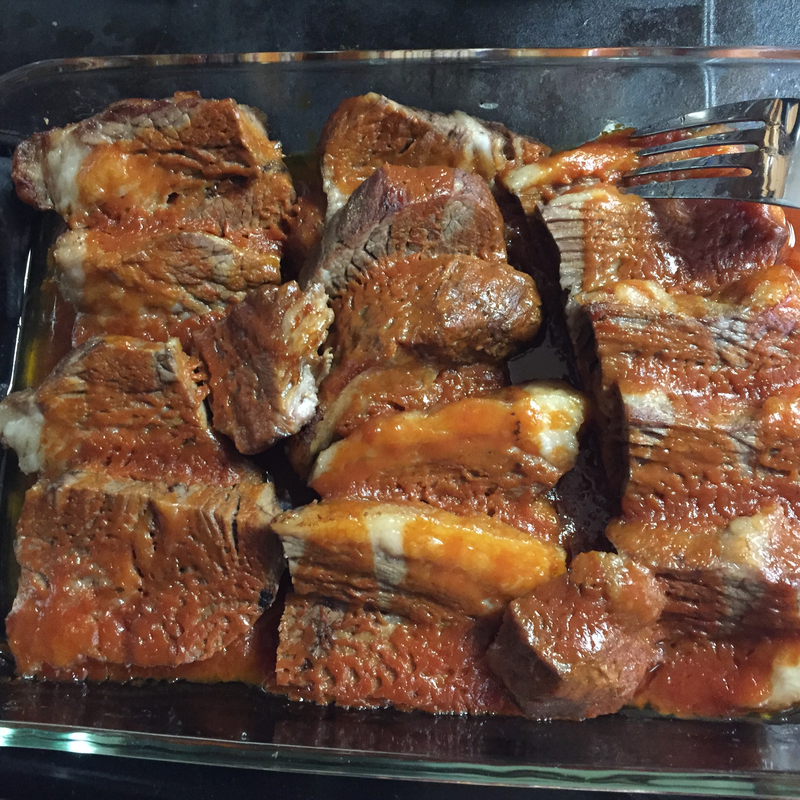 Note: I rubbed in 2 1/2 Tbsp of Wright&apos;s liquid smoke into the meat; my dry rub was 2 1/2 teasp Kosher salt 1/2 teasp freshly ground pepper 2 teasp onion POWDER and 1 1/2 teasp garlic POWDER--combined in a small bowl then rubbed into the meat. 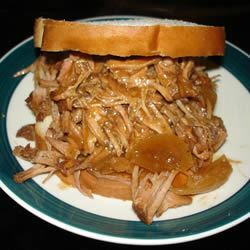 I will use this recipe again for sandwiches or any other use requiring cooked meat--really tasty!! Great stuff am making again. Reccomendations: Don&apos;t worry about the celery salt. Also after cooking take out of the oven and let sit for an 45 minutes to re-absorb the juices before cutting and adding sauce. Also when initial slicing slice across the grain of the meat. 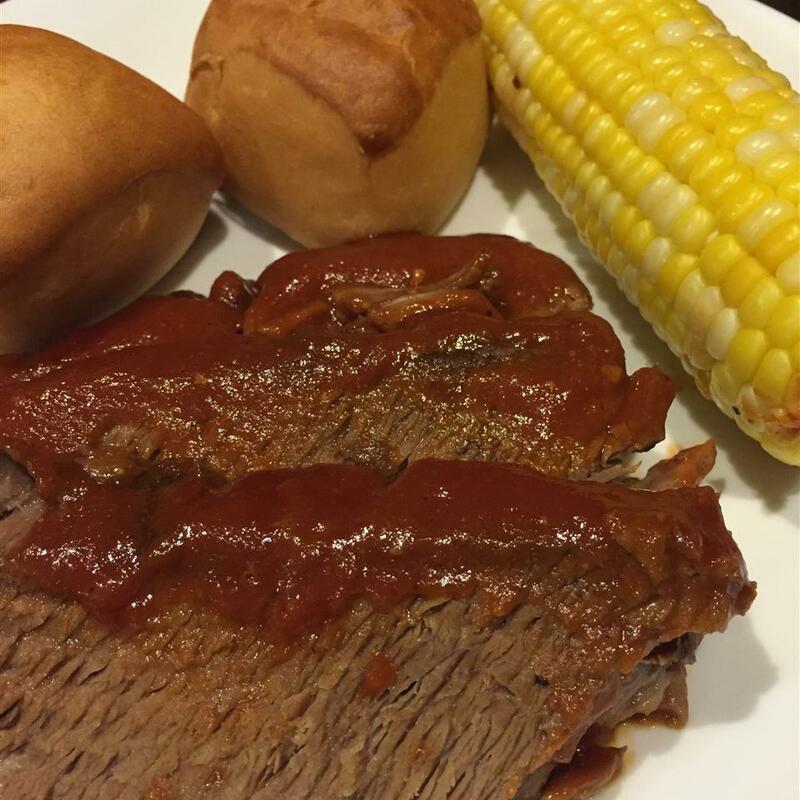 This is our favorite oven-baked brisket recipe. 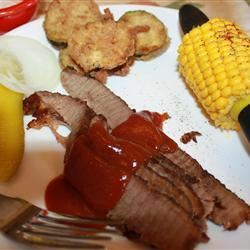 The meat is moist and tender and the flavor goes well with the sauce...which is now my favorite BBQ sauce. 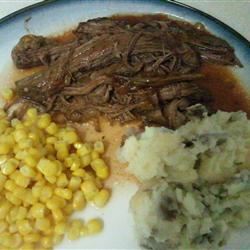 We&apos;ve used this recipe several times and have two ways of finishing the brisket. 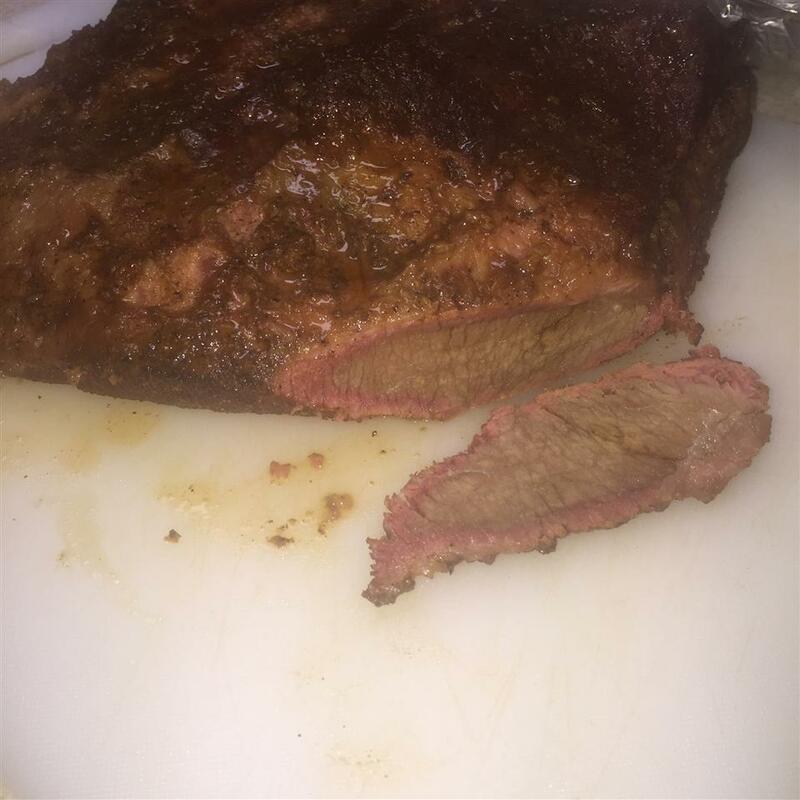 If my husband is home (he&apos;s the grill-man) I use less liquid smoke and have him throw the brisket on the grill with either hickory or mesquite chunks during the last 1/3 of the cooking time. 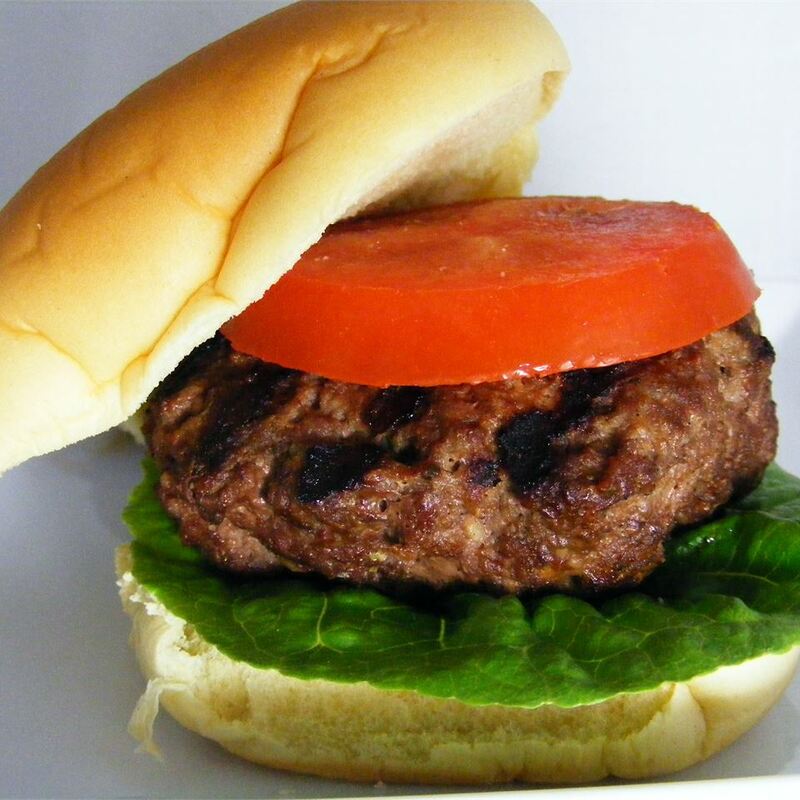 This gives the meat a nice brown grilled texture and flavor and adds a bit of smoke flavor to the meat. 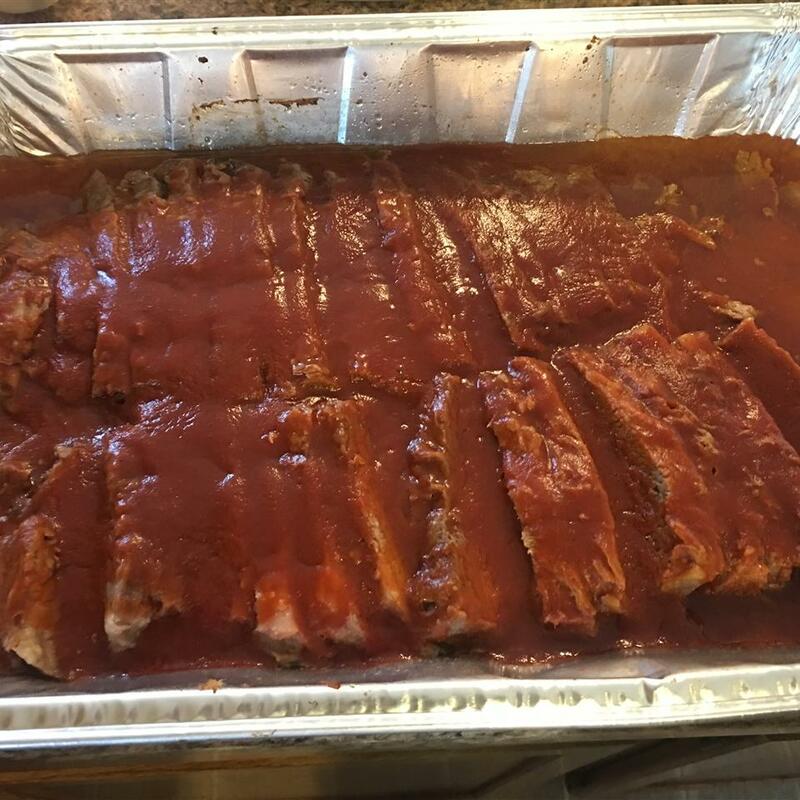 If he&apos;s not home I double the liquid smoke and remove the foil during the last 10-15 minutes of cooking after slicing and adding sauce to caramelize the sauce a bit...makes it richer on top of the meat. We always double or triple the sauce and serve the extra on the side. 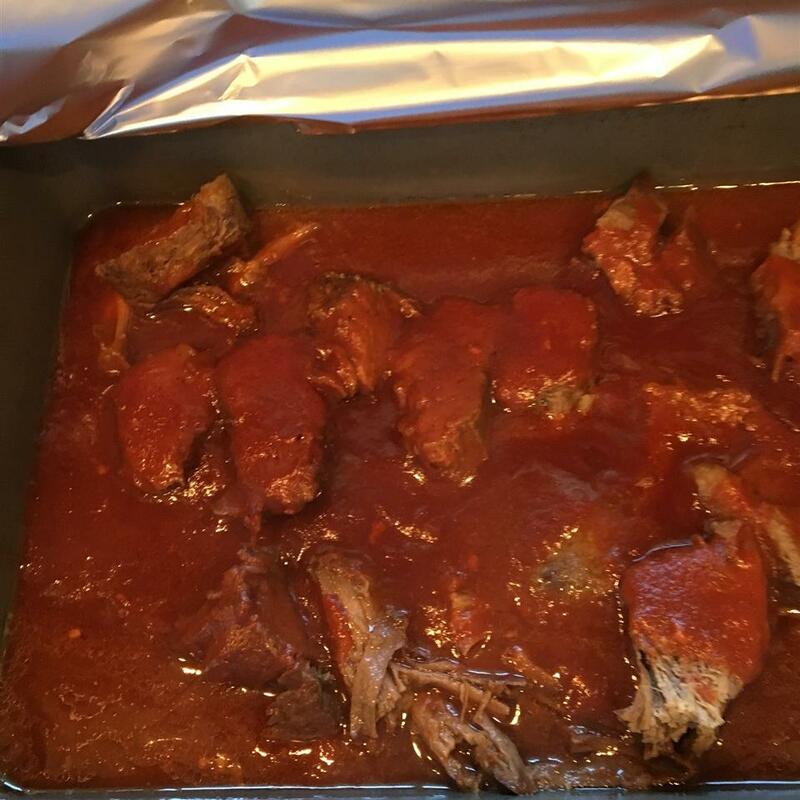 I find that the sauce has better flavor if made the day before the brisket and left to sit in the refrigerator overnight...lets the flavors mingle. 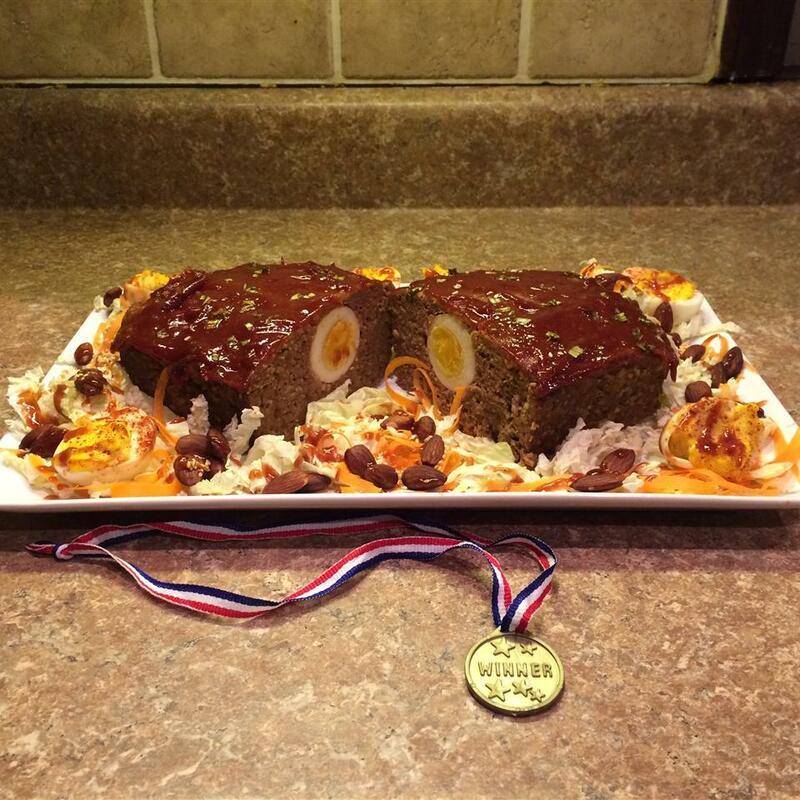 I made this in a crock pot for Super Bowl XLI. I used the modified instructions that were listed by member "TLQUICK". 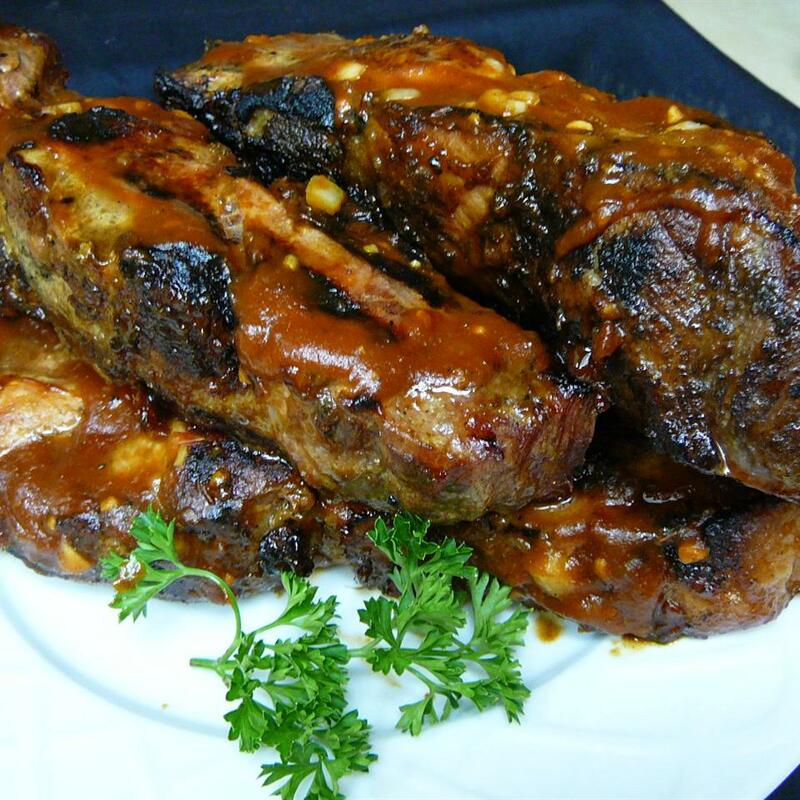 It was a delight before adding the barbecue sauce and made better after the addition of the sauce. It has a zesty smoky buttery taste. I served it on petite Kaiser rolls. It tasted like I put a lot of work into it but the recipe was low maintenance. UPDATE: I made it a second time and tried cutting the recipe in half. It didn&apos;t work out very well. Don&apos;t scale it down. Hey Cathy...those of us from West Texas know a good brisket recipe when we see it...and no one knows how to prepare them any better. 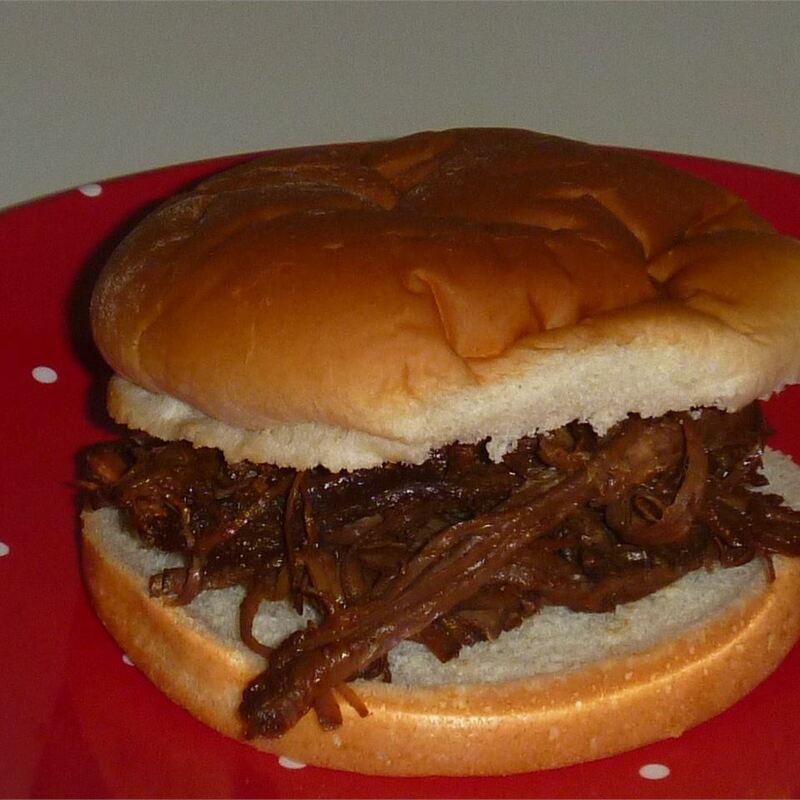 My favorite food is brisket sandwiches with mustard and cheese..(may sound odd but it&apos;s sooo good.) Definitely marinate this overnight so the flavors are absorbed by the meat. I cook mine in a reynold&apos;s turkey bag. What a great recipes. Thanks so much!! This has become our favorite family dinner. 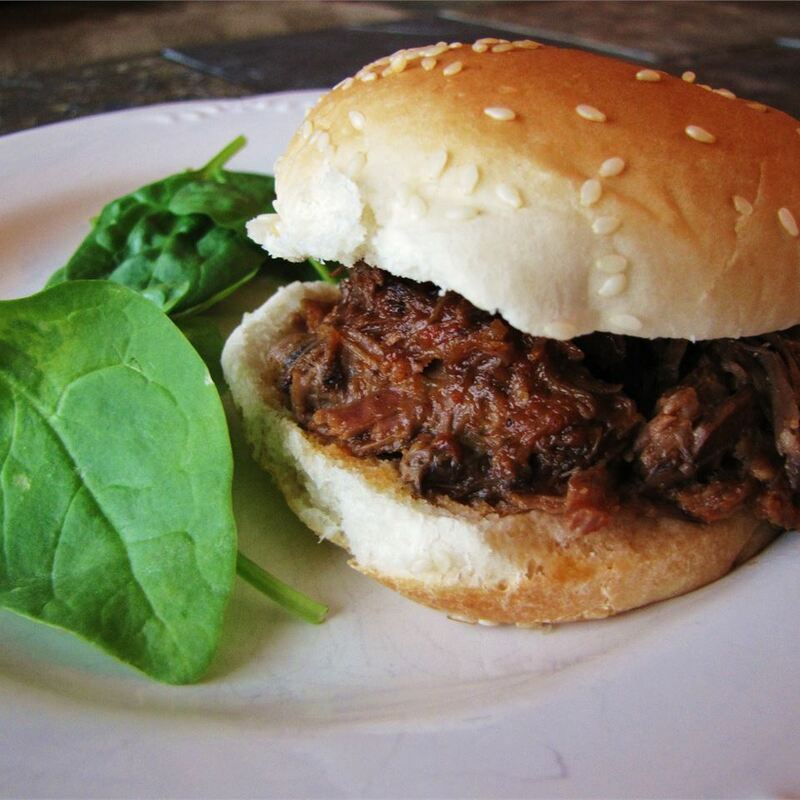 By preparing the meat the night before and cooking all day in the slow cooker it makes a great weekday dinner. I always make enough for leftovers. Note - I use garlic powder rather than garlic salt in preparing the meat. The first time I made it with both onion and garlic salt it came out too salty for our taste. 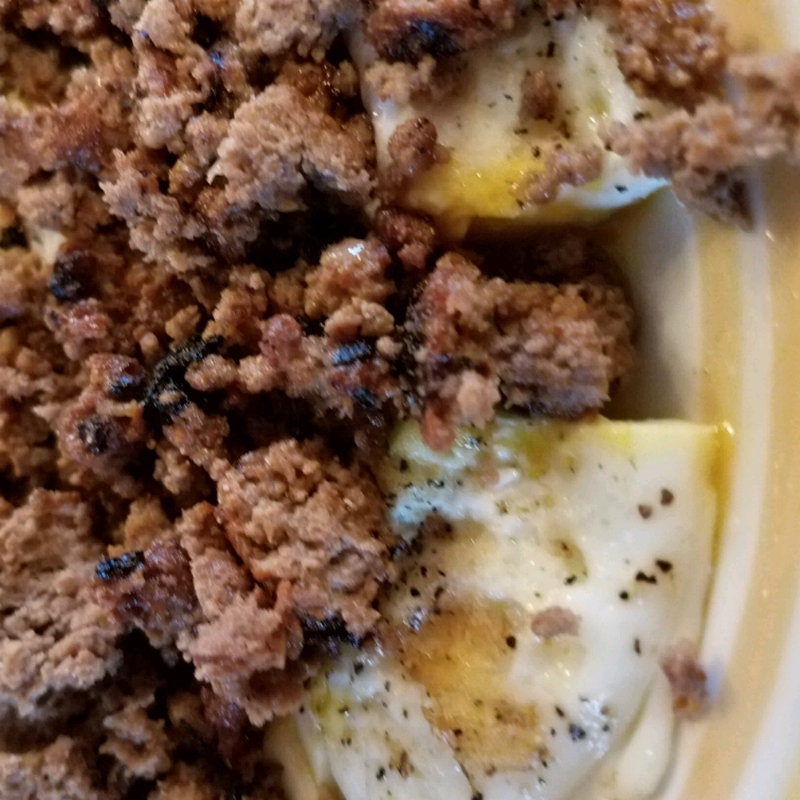 My whole family loved this meal. I followed others suggestions and doubled the sauce. 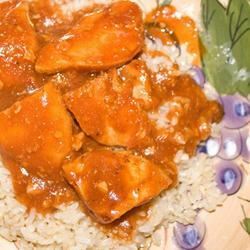 This was a good suggestion I used the leftover sauce to make bbq chicken and it was a hit also. I did spice up the sauce somewhat. We like things spicy...I added fresh garlic and some red pepper flakes. I also doubled the liquid smoke. The only other change I made was to use fresh garlic and onion for the marinade. TRY THIS ONE. YOU WILL LOVE IT!!! This is very good. 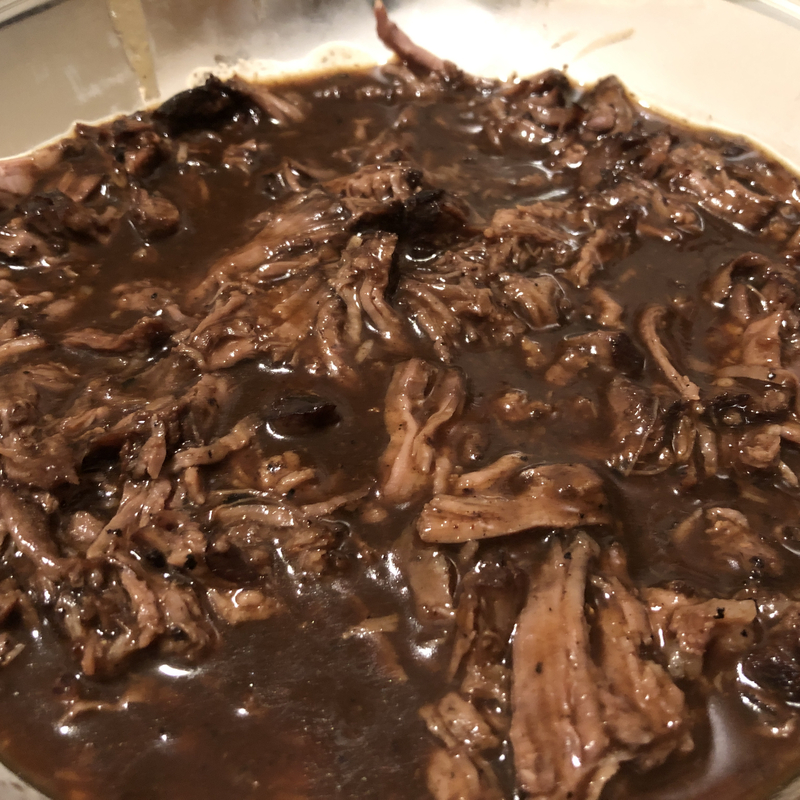 I made it in my crock-pot I seasoned the brisket for 2-days in frig then just placed the meat along with the sauce in my cp and cooked on low for about 14hrs. 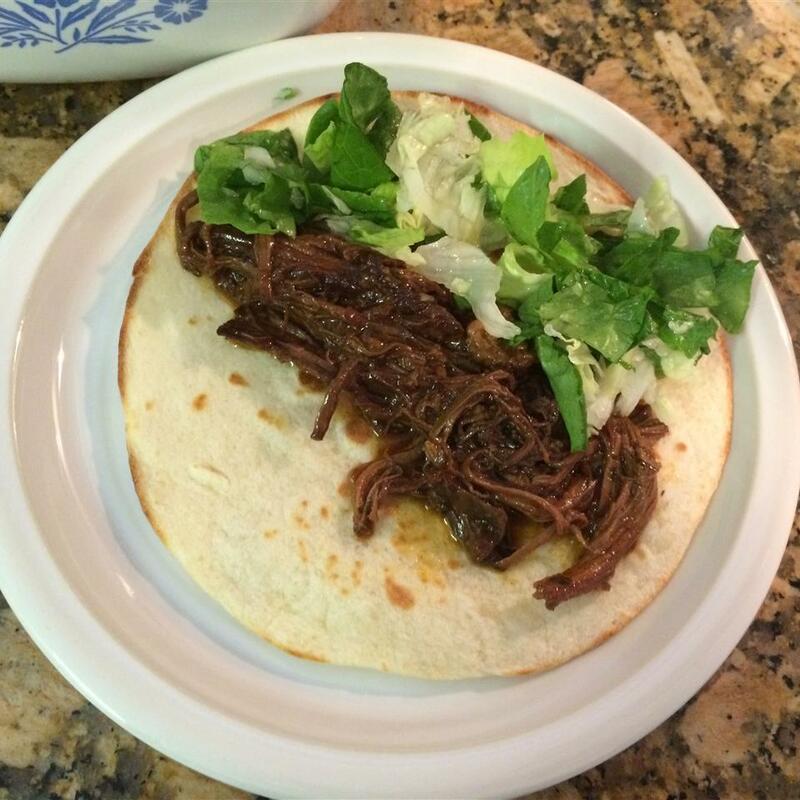 My family enjoyed the flavor and the leftovers were wonderful. Thnx for the quick & easy recipe.